When visiting Charleston South Carolina, and you are downtown there are so many streets and buildings that many tourist and local visit many times over. Finished in 1990 Water Front Park was established located on 1Vendue. With over 1000 feet and a incredible view of the water, for visitor and locals,it is a tiny source of tranquility in the midst of the hustle and bustle of the city with beautiful views of the marsh lands overlooking the USS Yorktown and Ravenel bridge, you will also get a glimpse of a cruise boats and sailboats heading out of the harbor. The park is filled with rectangular lawn a two very large water fountain, old fashioned park benches, a pineapple fountain that is unique and very different, beautiful palm trees and family size swings, and spectacular amazing trees that surround the property. As a wedding photographer I am always intrigue with the plateau of beautiful images you can create here at Waterfront Park for my wedding clients. Here is a great example of just that. 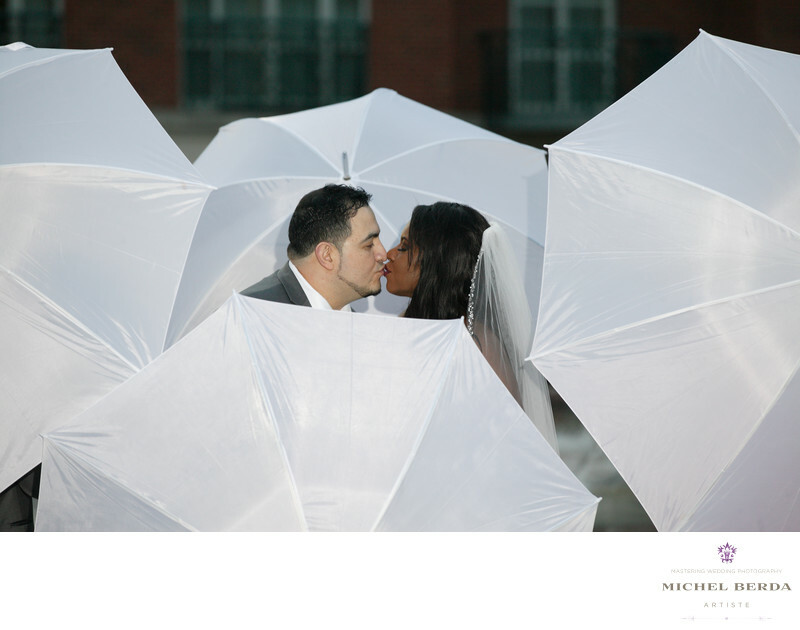 The couples day was planed for scattered showers, being that I had already created a fabulous timeline for my clients with a backup for situation just like this, and by being very fortunate to have umbrellas just for this occasion, I wanted to use them in an image. As I started photographing the couple I had the water fountain and it was beautiful, but I wanted to create art and way more then that. With the bridal party ready to help with any request, I posed the couple perfectly and asked the bridal party to create a shield around them as if they were protecting them and using the umbrellas has shields. The result of this image could not have come out more perfectly, while being emotional, with the right feeling for the mood and the moment. The couple got this image as a teaser social media image. The mother of the bride posted this comment coming from Alexis' mother, you are the best. Thank you again. That is all you can ever hope for in every client.Keywords: Charleston (1179), charleston south carolina (9), Michel Berda (1140), photographer (1125), pineapple fountain (3), Ravenel bridge (3), umbrellas (3), USS Yorktown (3), Water Front Park (21), Wedding Photographer (1254).